Theoretically, a stretched chemical bond exhibits a dynamic breaking behavior due to the competition between the spontaneous thermally-activated and mechanically-activated breaking mechanisms: the breaking force is constant at low force loading rates (FLRs), increases at intermediate FLRs and reaches a constant value at high FLRs. 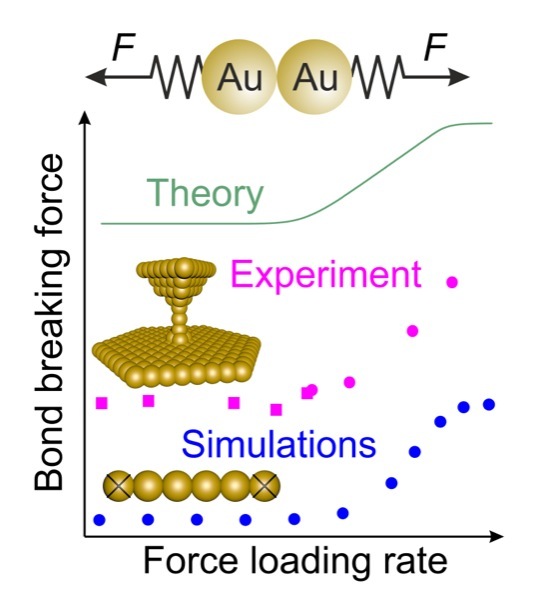 For the first time, the dynamic breaking behavior was demonstrated for a single chemical bond between two gold atoms in current-sensing atomic force microscopy experiments (Dr. Ilya Pobelov and the group of Prof. Wandlowski) and explored in molecular dynamics simulations (Prof. Gemma Solomon, University of Copenhagen). "Dynamic breaking of a single gold bond"
Nature Communications, 2017, 8, 15931; doi:10.1038/ncomms15931.